ACEO® is offering a unique drop-on-demand 3D printing technology for silicones. The technology is offered as an exclusive B2B service. The technology is based on a “drop-on-demand” principle. The print head deposits single silicone voxels on a building platform, which flow together smoothly, forming a homogenous surface. After printing a layer, the curing is activated with UV light. 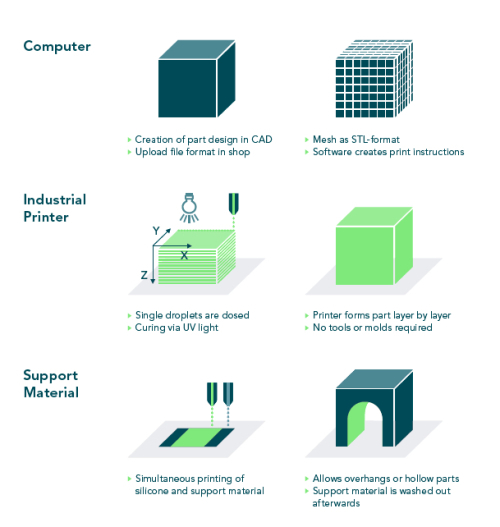 For complex 3D structures, a support material is printed throughout the same process. At the end of the print job, the printed silicone is removed from the printer and the environmentally safe support material is easily and quickly rinsed out with water. Proven silicone experts from WACKER Chemie AG developed not only the materials but also software and hardware opening up new opportunities for various industries such as healthcare, automotive, electronics or even lifestyle goods to name a few. It is ideal for prototyping, individualised goods and integration of functionalities or manufacturing of “impossible products” meaning designs which could not have been produced with any other technology so far. ACEO® Silicones are the first elastomer thus the first real elastic material which can be 3D printed. This is what the world of prototyping, rapid production, small series and customization has long been waiting for. Throughout the 3D printing process silicones keep their outstanding properties enabling them for demanding engineering applications. Among other outstanding properties, silicones display flexibility and elasticity, weather stability, wide range of application temperatures, radiation resistance, haptics and physiological inertness. They are available in Shore A hardness from 10 to 80 and various colors, even intensive black. FDA compliance and biocompatibility is provided.